In 2013, at least 136 countries were active in public diplomacy, both as principals and/or receivers, and PD activity took place in every region of the world. As represented in Figure 1, the United States, China, India, Russia, Israel, and the United Kingdom were the most mentioned actors in PD stories throughout the year. Notably, 70% of UN-recognized nations, as well as the Holy Sea and Palestine, conducted or received public diplomacy activities. In addition, two supranational actors, the UN and the European Union, conducted and received substantial amounts of public diplomacy as collectives. Clearly, public diplomacy is now broadly embraced around the world. The year’s leading PD actors were, not surprisingly, the United States, China, India, Israel, and Russia. The 10 most discussed PD actors of 2013 reflect the importance of PD in most regions of the world (Figure 2). Conspicuously absent from the top 20, are African nations, with only Nigeria ranking as the 26th most talked about country of 2013. Central and South America are also largely missing from the English-language public diplomacy conversation, with only Brazil present in the top 20. In the Spanish-speaking Americas, Mexico ranked 21 and Venezuela 29. No other countries from the region were present in the top 50. In order to understand the breadth of public diplomacy activities in 2013, we identified 12 categories of PD function and based on its primary focus, we placed each public diplomacy story analyzed within one of these categories. 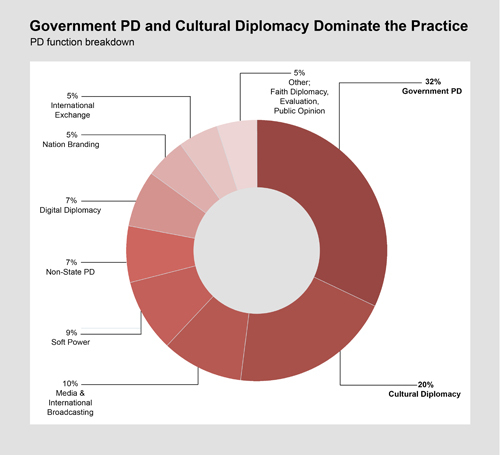 As Figure 3 shows, Government PD and Cultural Diplomacy are the dominant practices. Media and International Broadcasting held the third slot with 10%, followed by Digital Diplomacy and Non-State PD with 7%, and International Exchange, Nation Branding, and Media & PD with 5% each. Public diplomacy is commonly understood as a practice through which to strengthen and increase an actor’s soft power, and while soft power is not a public diplomacy practice per se, it is identifiably the focal point of many international entities. Therefore, we included Soft Power as a theme of public diplomacy stories, which 9% of our 2013 stories fell under. 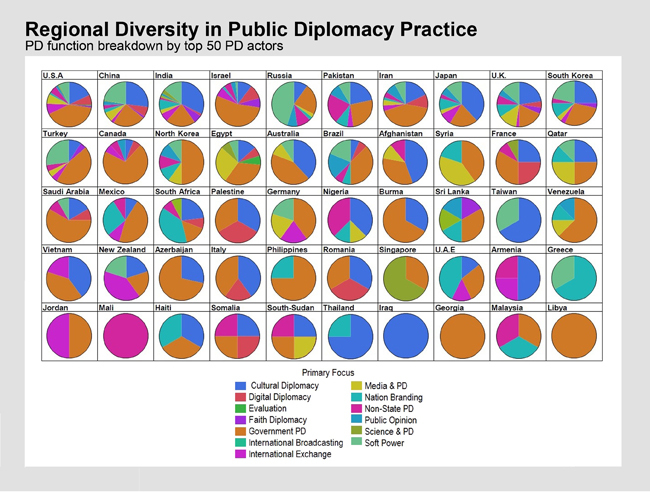 Figure 4 demonstrates the 50 countries most active in PD, broken down by their use of public diplomacy functions. As shown in this survey of media coverage, the most popular types of public diplomacy for African nations were Nation Branding, Cultural Diplomacy, and International Exchange. For the Americas, Government PD was the clear winner. In Asia, Cultural Diplomacy, Soft Power, and Government PD took the lead. Europe demonstrated the most topical diversity within a region, with Government PD only slightly ahead, while Soft Power was most prominent for Russia. In the Middle East, Government PD and Media were the preferred PD activities. In South Asia, there was a wide array of PD activities, with Cultural Diplomacy at the fore, but not significantly outshining other activities. Though public diplomacy activities have often been considered unidirectional communications in a bilateral context, PD is no longer conducted in that way. Today, PD is an interactive, multilateral system. Our collection of PD stories from 136 countries indicates that public diplomacy is being sent and received by the majority of countries worldwide. 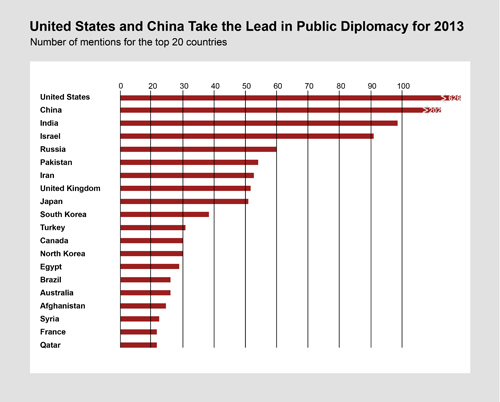 The leading public diplomacy initiator for 2013 is the United States, with China, India, Israel, the United Kingdom, Russia, Japan, South Korea, Pakistan, and Turkey rounding out the top ten PD initiators. 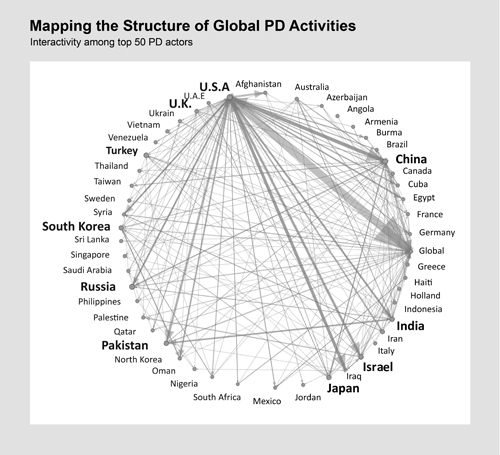 These countries were also some of the top recipients of PD: The two main target publics for PD activities worldwide were the general global audience, and the American public followed by China, India, Israel, Russia, Pakistan, Syria, Afghanistan, Iraq, and Iran. The United States is the leading PD actor by far in comparison to all other countries. 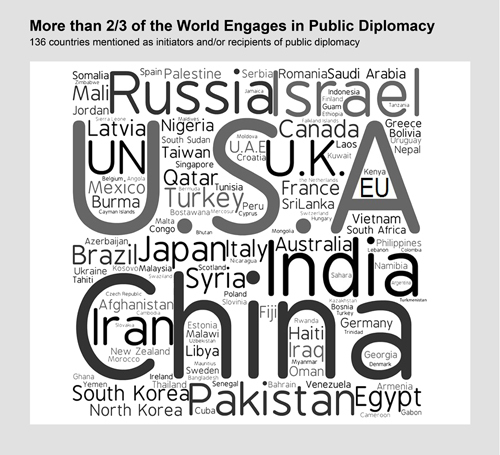 In addition, the interactivity of the public diplomacy system is especially apparent between the United States, China, Israel, India, Turkey, and Russia. Much public diplomacy is not conducted in a bilateral capacity, but in a multilateral capacity, including efforts directed at the global public.